A truncated form of the Ti-plasmid virE2 gene from Agrobacterium tumefaciens strains C58 and A6, and A. vitis strain CG450 was transferred and expressed in somatic embryos of grapevine rootstocks 110 Richter (Vitis rupestris × V. berlandieri), 3309 Couderc (V. rupestris × V. riparia) and Teleki 5C (V. berlandieri × V. riparia) via Agrobacterium-mediated transformation to confer resistance to crown gall disease. 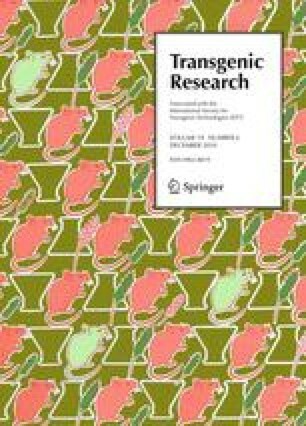 Transformation was confirmed in 98% of the 322 lines by enzyme-linked immunosorbent assay for the neomycin phosphotransferase II protein and 97% of 295 lines by polymerase chain reaction for the truncated virE2 transgene. Southern blot analysis revealed the insertion of truncated virE2 at one to three loci in a subset of seven transgenic 110 Richter lines. In vitro resistance screening assays based on inoculations of shoot internode sections showed reduced tumorigenicity and very small galls in 23 of 154 transgenic lines. Non-transformed controls had a 100% tumorigenicity rate with very large galls. Disease resistance assay at the whole plant level in the greenhouse revealed seven transgenic lines (3 lines of 110 Richter, 2 lines of 3309 Couderc and 2 lines of Teleki 5C) were resistant to A. tumefaciens strain C58 and A. vitis strains TM4 and CG450 with a substantially reduced percentage of inoculation sites showing gall as compared to controls. No association was found between the level of resistance to crown gall disease and the source Agrobacterium strain of virE2. Taken together, our data showed that resistance to crown gall disease can be achieved by expressing a truncated form of virE2 in grapevines. The online version of this article (doi: 10.1007/s11248-010-9373-x) contains supplementary material, which is available to authorized users. We are grateful to Dr. Marc Fuchs for critically reading the manuscript.